White House prepares for potentially historic storms along the East Coast. President Trump called his administration's response to Hurricane Maria in Puerto Rico — where an independent study suggests nearly 3,000 people may have died — an "incredible unsung success." "I think Puerto Rico was incredibly successful. Puerto Rico was actually our toughest one of all because it is an island," Trump said Tuesday in the Oval Office, noting that boats were deployed to deliver supplies to island residents. "I actually think it is one of the best jobs that's ever been done with respect to what this is all about," he added. San Juan Mayor Carmen Yulín Cruz, who has been critical of the Trump administration's response to Hurricane Maria, blasted Trump's newest boast in a Tweet on Tuesday. Trump made his comments as the director of the Federal Emergency Management Agency briefed White House officials on the agency's preparations for the arrival of Hurricane Florence. "We're all ready. FEMA is ready. Everybody's ready. I think most importantly the people are ready. We're all ready for it. Everybody is standing by,” Trump said earlier to reporters, following a 9/11 event in Shanksville, Pennsylvania. “There's a chance it could be a very bad one. We're absolutely prepared." 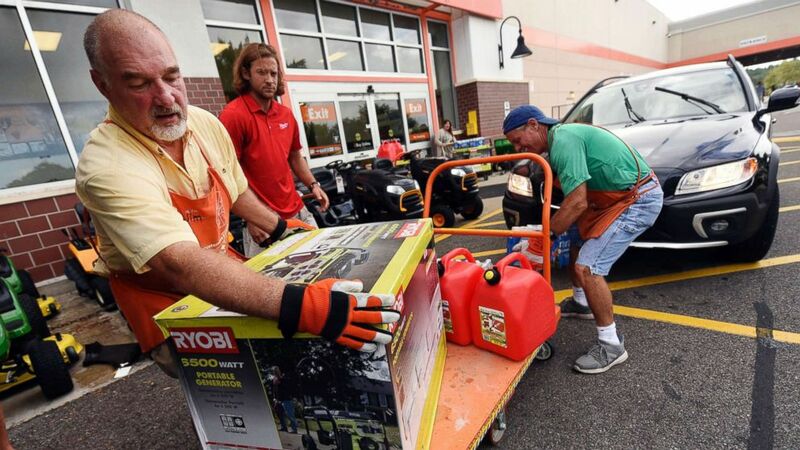 (Ken Blevins/The Star-News via AP) Jim Craig, David Burke and Chris Rayner load generators as people buy supplies at The Home Depot on Monday, Sept. 10, 2018, in Wilmington, N.C.
Tom Bossert, the president's previous Homeland Security adviser, outlined some of the challenges facing the White House on ABC's The Briefing Room. "You have to express to the president and all the leaders in the federal government that you're not in charge, and that feels a little difficult for people used to feeling in charge," Bossert said. "The idea here is that we're trying to get a lot of people who don't work for one another to work in a unified effort to get things done." Bossert said that in these situations, it's not the president but the mayors and governors who are in charge. "I'm reminding the president don't overpromise, and don't oversell," Bossert said. “We are marshaling every available resource to ensure maximum preparation for rapid response. That's what we had last year. Disaster response and recovery is best achieved when it's federally supported, state-managed, and locally executed,” Trump added. “I think we did a fantastic job in Puerto Rico. We're still helping Puerto Rico,” Trump said. “The governor is an excellent guy. And he is very happy with the job we've done." “I think most of the people in Puerto Rico really appreciate what we've done,” Trump added. (Joe Raedle/Getty Images) Michael Schwartz (L) and Jay Schwartz secure plywood over the windows of their business ahead of the arrival of Hurricane Florence, Sept. 11, 2018, in Myrtle Beach, S.C.
(Zach Gibson/AFP/Getty Images) People cross the street as water floods outside buildings in Old Town Alexandria, Va., Sept. 11, 2018. More than a million people were under evacuation orders in the eastern U.S. Tuesday, where powerful Hurricane Florence threatened catastrophic damage to a region popular with vacationers and home to crucial government institutions. 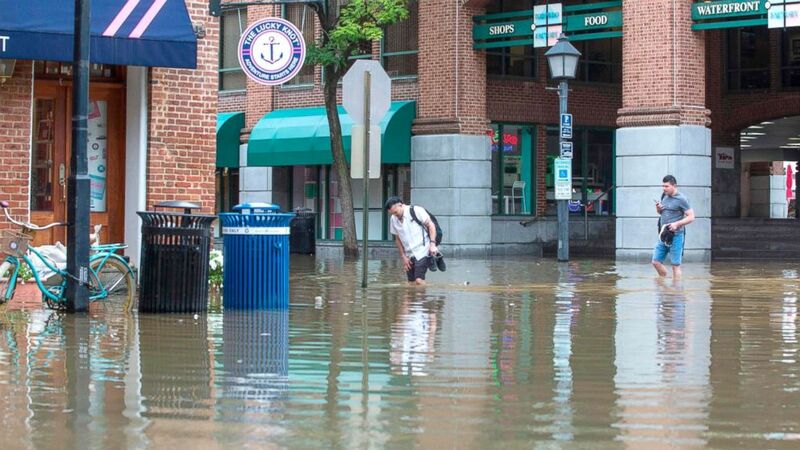 "The White House should act quickly to declare a federal emergency in Virginia as they did in the Carolinas so we can have federal assets to help Virginians affected by the hurricane,” Sen. Tim Kaine, D-Virginia said in a statement to ABC News before the declaration was made. ABC News' Joshua Hoyos and Ali Rogin contributed to this report.